Does your family love parfaits? Mine does. I think the pineapple and banana in this parfait sounds amazing. This makes an amazing start to the day or a sweet treat without the guilt after dinner. 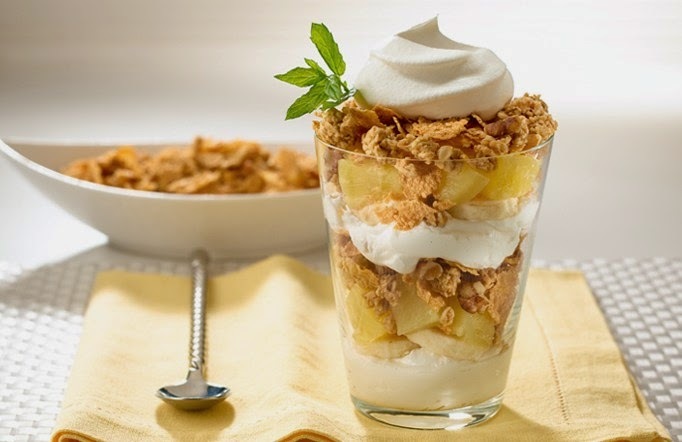 Spoon half of the yogurt evenly into six parfait glasses; top with layers of half each of the bananas, pineapple, cereal and remaining whipped topping. Repeat layers. Drizzle honey over final layer. Thanks to my friends at Post for sharing with me and inspiring me to share with you. ohhhh this does sound so delish!! and looks pretty too! You don't often see banana and pineapple together and yet they are so tasty together! This is a fantastic parfait but I never think about making them. Thanks for sharing with us at the #WWDParty and enjoy the holiday. Your parfaits sound delicious! What a great, healthy treat! This is the perfect afternoon snack! Thank you for sharing on Mommy Moments. Pinned this! Looks yummy! Thanks for linking up to the Bloggers Brags Pinterest Party. I have pinned your post to the Bloggers Brags Pinterest Board. Do you really add 1 cup of honey to it? Oh yes, I could totally dig into this right now!! I would just love your Banana Crunch Parfait! Thank you so much for sharing this awesome post with Full Plate Thursday and hope you are having a fantastic weekend! What a smart idea to use the Banana Crunch cereal. I only ever think of granola with my yogurt. Great recipe! Thanks for linking it up at This Is How We Roll Thursday. I recently made a similar "fruit and yogurt" parfait, similar to this and they were delicious! A great simple and healthy snack or dessert!! Great combination of flavors. Thanks so much for sharing this with all of our Let's Get Real readers. I love the drizzle of honey on the top. My kids think of honey like it is caramel. Honey makes everything extra special. Thanks for linking up to Saturday Sparks. You have been featured today. Looks refreshing but I was curious too, about the measurement of honey! I love honey and use it very sparingly in even my tea drinks! Thank you for sharing and enjoy a fun weekend. Gosh Sara. I'm drooling. I love the sound of this. It looks delicious. Thanks so much for linking up to Thriving on Thursdays. It's a real pleasure to have you. I'm featuring this one at tomorrow's party. Thanks for coming and I hope to see you again soon. Looks yummy! Thank you for joining us at THT. I can't wait to try this. I need to incorporate more fruits into my diet. I don't eat breakfast during the week, but it's my favorite meal of the day. 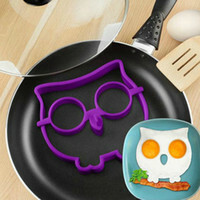 I'm definitely going to pre-make a few of these so I can start getting my breakfast on.